A Marmite game - you either love it or hate it. 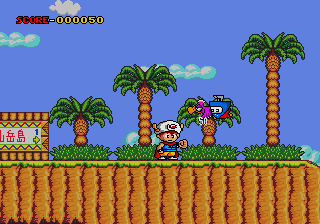 Comparisons have been made with Kid Kool/カケフ君のジャンプ天国 (Kakefu Kun no Jump Tengoku) on the NES, and じかるハットのぶっとびターボ!大作戦 (Magical Hat no Buttobi Turbo! 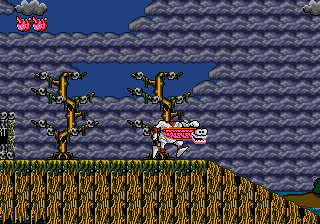 Daibouken) and Decap Attack on the Mega Drive, but for true SMS fans Psycho Fox is the original and best, regardless of the facts. The game is heavy on inertia and the different playable characters make it more interesting. These are perhaps the same things that some people dislike about the game. 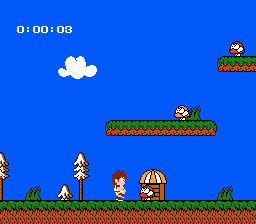 There are also “warp zones” hidden through the game allowing you to skip forward to later levels, which add a bit to the interest of the game. The “Bird Fly” gameplay is refreshingly different to the usual platform fare. The maps below were created by rouken (rouken at bol dot com dot br). They differ from my maps because they do not include any enemies; instead, they show the warp zones and egg contents. Also note that the warp zone levels are not included either. You are a fox, out to destroy the evil Madfox Daimyojin who has taken over the world, enslaved the creatures, etc. You have the ability to transform (using a “Psycho Stick”) into a hippopotamus, monkey or tiger to gain different characteristics. You can also pick up a “bird fly” which you can launch at enemies to kill them; when you’re carrying it you can’t punch, but you can take a hit without dying. Punch eggs to get things from inside them.